Therefore there's only a short post from me today - showing you little Winter Susan. I think she's perfect - and actually works for Spring as well, since we still haev tons of snow here. We are seing spots of grass - but that's it. The snow is slowly, slowly melting. I therefore wanted to colour Susan in more Spring colours - to give me some hope - that Spring is going to be here soon. * Viva Decor products - if you have not tried them - you def. need to. They are so fun to play with and the result is just beautiful. * Zva Creative flowers, pearls and rhinestones. It's the last March TIOT and this time Suzanne wanted us to use her fun sketch below. Of course I needed some extra bling - and isn't it fun that you can create your own pearls? 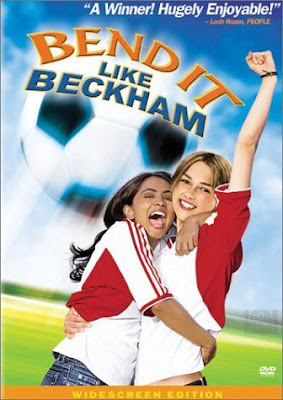 Must be every girls dream... I used my Viva Decor pearl pens. Hope that you've seen them over at SCACD. Love, love, love them! My DT-sisters also have some tutorials on how to use them. You'll find the tutorials here - under the Product section tutorials. Hope you like it and as always - looking fwd to read from you. I'm hoping that I will get more time to visit each and one of your blogs during Easter break. This week is going to be a very exciting! The Greeting Farm Royal Battle is on! Wishing all the teams that participate - Good Luck! 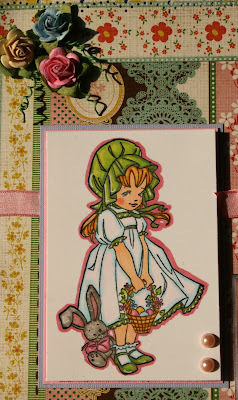 It's like the American Idol for cardmakers - using the Greeting Farm images. The first weeks challenge is about Retro and using these colours. Well - make sure that you check the cards out and of course I hope that my team - The Rosebuds will survive round no 1. Jodi's done an amazing job with the challenge! "You must be registered to vote. Click on Register and fill out the form. You will be sent confirmation info to your email and you must click the link to officially be activated. If for some reason you do not recieve it, just email me and I will manually activate your registry. Once you are activated, go back to http://thegreetingfarm.com/galleria/ and login. Vote for your top 3 choices. When you comment, that counts as your vote. So Comment on your top 3 choices. ANYONE and EVERYONE can vote. " So if you love the card from The Rosebuds this week - please make sure that you vote before Tuesday! So here's my little contribution to Easter - featuring cute Bunnie. Coloured her with my copics. DPs from Basic Grey. Attached some cute mini-roses and pearls as well. 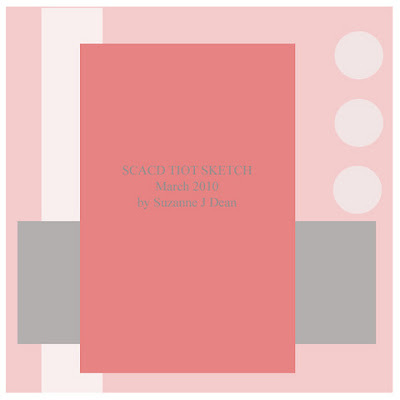 Hope you like her and make sure that you check what you need over at SCACD - so that you have all the fun to play with this Easter. It's getting closer to the weekend and I can tell you - I'm soo looking fwd to that. Why? Well - I want more time to colour these new BnW cuties. I think they are so adorable all of them - so it's hard to choose - right? 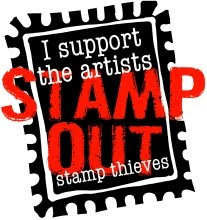 And for those of you that are hesitating just because they are clear stamps - I can only say - that you def. need to try for yourself. My personal experience is that they work perfectly. I received a crisp and clear image every time. So with that said- over to my card for today - showing Bronzing Beauty. Isn't she a cutie? Hope you like her and please - feel free to let us know if you have any questions regarding these new cuties. Before I tell you about my card for today - a HUGE thank you for all your sweet comments on my card for the BnW blog-hop! I will try to visit each and one of you to see what you are creating. So happy that you love these cuties as much as we do. Today we have a new challenge over at RoP/BnW. Our sweet Rosette has asked us to use our punches. Well - I think I got carried away...*lol*. 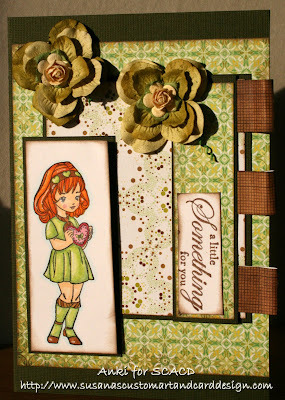 Used one of my corner punches, Martha Stewart punch, SU punches (the circles) and my flower punches. DPs from Basic Grey. Pearls and ribbon from stash. Sentiment is a rub-on that I got from my supersweet and talented friend Tammi! Love this new image - "Splashing Good Times" - so I wanted this card to be bright, colourful and fun. Hope you like it and make sure you visit the rest of the DT ladies to see what they have been up to! The snow is slowly melting here in Sweden. The sun is getting warmer and brings us a lot of new energy. And with more energy - it's time to get on with the Spring cleaning - right?! If you have arrived from my mega-talented DT-sister Rosette's blog - well - then you are on the right track. If not - then you might want to start from the beginning over at our BnW blog. Also - we would love to hear your comments. We don't want anyone of you to miss the chance of winning the full set of this new release of BnW images. Make sure that you read the details on our BnW blog - for information on how to enter. I have the honor to present little Belle Dusting Cuckoo. Inked her up with my Memento Rich Cocoa Ink and coloured her with my copics. The reason why I used Rich Cocoa instead of Tuxedo black was that I wanted a softer and "older" style. 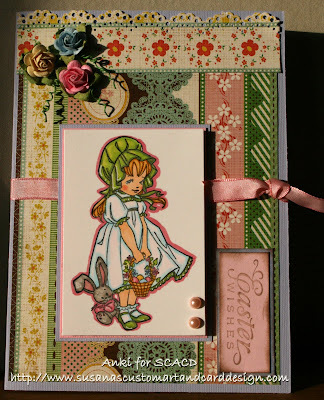 The DPs, ribbon and flowers are sent to me from my sweet friend Tammi and they inspired me to go a little bit more vintage - nothing that you see that often from me :-) I hope you love her as much as I do. Elisabeth Bell has done it again! These new Belles'n Whistles stamps are sparkling clear! 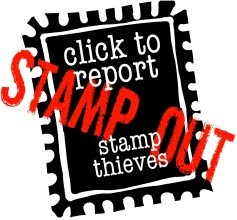 They are the finest of sparkling clear, genuine photopolymer stamps around, made in the US! I can only say - you are going to love your new sparkling clear Belles'n Whistles stamps! Looking fwd to hear from you. Now you should pop over to my talented DT-sister Iris blog . Well - I have not completely lost it... *lol*. 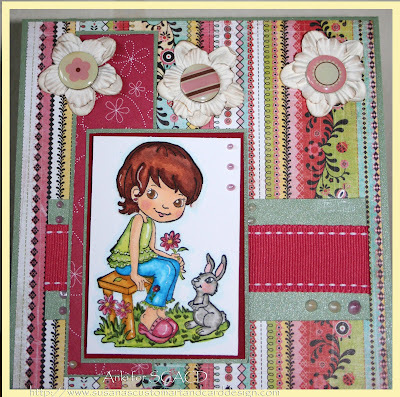 Try it out Tuesday challenge this week is to be inspired by a movie and create a card using that inspiration. It was easy for me to pick a movie - using one of the new and wonderful VC stamps for SCACD. So please meet Little Jennifer - now a movie star! Coloured Jennifer with my copics and added a little pearl smooch on her t-shirt. DPs from Basic Grey and of course - I needed some roses on the card. Added a ribbon from stash and attached a little flower charm. The sentiment is a rub-on. Hope you like it and make sure that you check out what the rest of the DT has been up to! 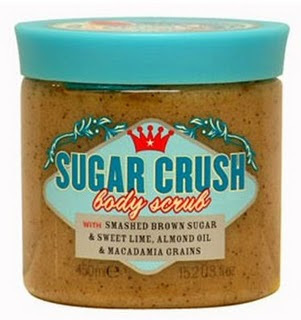 First of all - thank you soo much for your sweet comments on our blog-hop creations yesterday! These new VC stamps are adorable - and we are glad that you like them as much as we do. Here's a quick post from me today - I wanted to show you how stunning our Little Danni is in her new hair colour - red ;-). I hope my DT sister Danni likes her new hairstyle??! I coloured her with my copics and added some pearls. DP from SU and my stash. Sentiment from Aud Design. Punches - SU and Martha Stewart. Kram and happy Saturday everyone! The VC-blog hop is here! 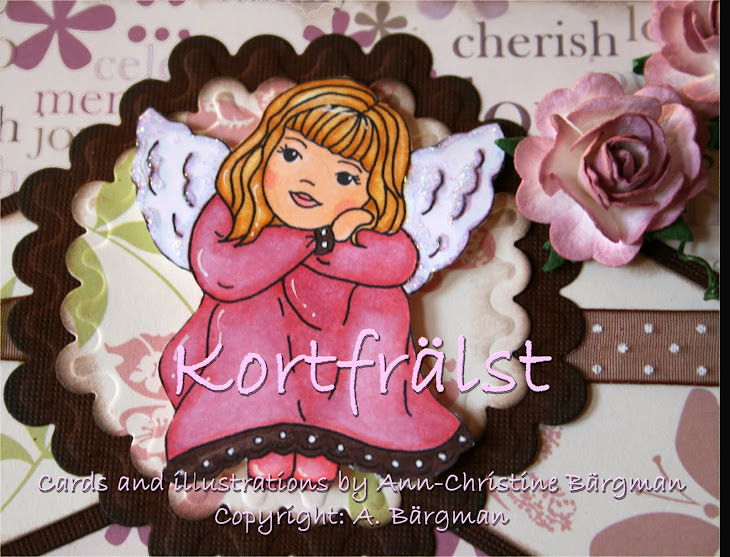 Welcome to another release taking place over at Susana's Custom Art and Card Design. Susana is really spoiling us all with her frequent releases - and all of them are always a MUST HAVE. Don't know how she does it, but she's one of a kind! Yesterday I received the latest product from Loreal (I will test and let friends and people know what I think about it - since I'm a Buzzador. 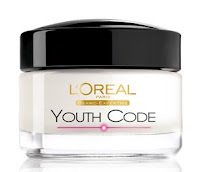 Well - the product is the Youth Code. Hope you like her and the rest of the new VC images. If so - pop over to SCACD and make sure that you get your hands on them! 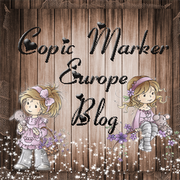 For those of you that have not completed the blog-hop or would like to start all over again - then you should visit my Norwegian DT sister - Aud's blog. First of all - I really hope that you have not missed the opportunity to enter for Susana's extremly generous candy? You find all the details here. Now off to my card. I coloured Latte with my copics. DP from Basic grey and the sentiment is a rub-on from my stash. Hope you like it and want to play along with us. Also - make sure that you stay tuned for our blog hop on the 12th! This weeks RoP/BnW challenge is hosted by our sweet Peta! This time she wants us to create a card/project using Easter/Pastel colours. I have been longing for a very long time to colour Tania baking again. She's one of my favourite images from the BnW collection. Coloured her with my copics and attached flowers, leaves, ribbon and pearls in matching colours. The colour of the roses are not showing correctly on the photo - since it was a little dark when I was able to take the picture. The sentiment is a rub-on. Hope you would like to play with us and make sure that you visit the rest of the DT girls blogs. Am I longing for Sunshine? Well - those of you that have been reading my blog - know the answer - YES!!! It seems like Spring is far, far away from us here in Sweden - but at least we had a very sunny day yesterday - with blue skies. It was so nice to be able to feel the sun warming my face again. Well - to warm you up I have coloured this wonderful BnW image - Sunshine and Apples. I just love the feeling I get from looking at this image. Don't you? Kramis and enjoy your Sunday! Hope your week has started well so far. Today I got the honor to show you Elisabeth Bell's latest Digi - released today - Pat-a-Cake! You've all been asking her for images with both girls and boys - and I think this is just adorable - don't you? Got to use some new yummy DPs that arrived in my mailbox yesterday. Cut out the circles with my nesties and added a couple of pearls and ribbon from stash. The flowers were sent to me earlier from my sweet friend Marlene. Also - make sure that you check Summer's post on the BnW blog today! This weeks TIOT is a colour challenge. Suzanne wanted us to use the colours Pink, Sage/Moss Green, Cream/White. As you can see - I went for Green, but with a little pink and cream accents. I decided to use I heart ya! 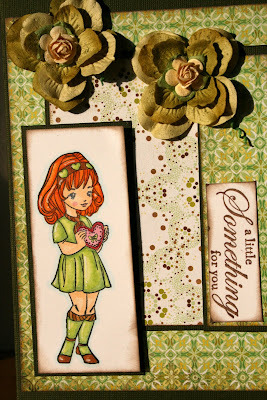 This cute little girl from the latest release of stunning E Bells for SCACD. Sentiment from SU. Hope you like it and want to play with us.